A steadily increasing dividend payout is viewed as a strong indication of a company's continuing success. Institutional traders and investors may need to track dividend dates, amounts and status by the seconds, minutes or hours. This is how Wall Street Horizon has structured its delivery - it's all about getting the data at the speed you need. Options for delivery include: GUI, API, XML data feeds or low-latency streaming feed. Subscribe to the Core Events Calendar to receive the dividend information you need. Wall Street Horizon's historical event datasets are the industry's largest, most detailed, and most accurate listings of this type of event data. 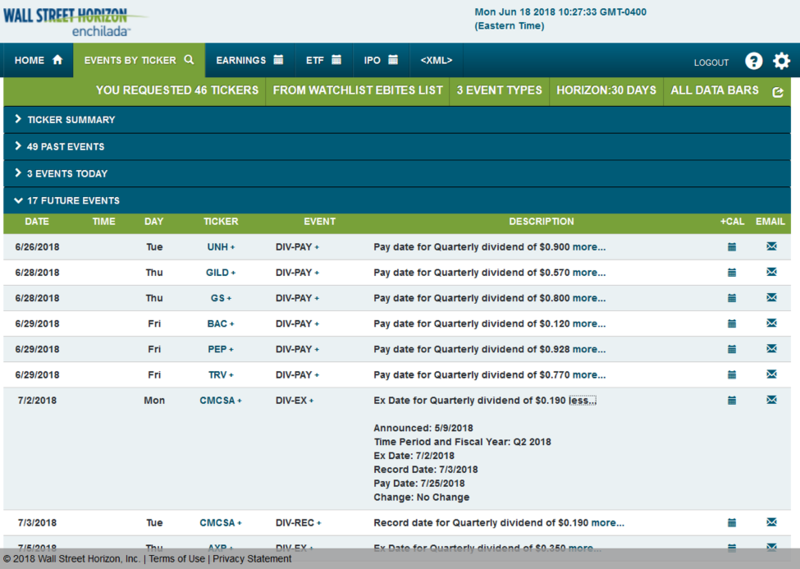 Dividend dates with timestamps derived from Wall Street Horizon analyst research.